Awesome Saddlebrooke Larado Home- Views from Both Patios! 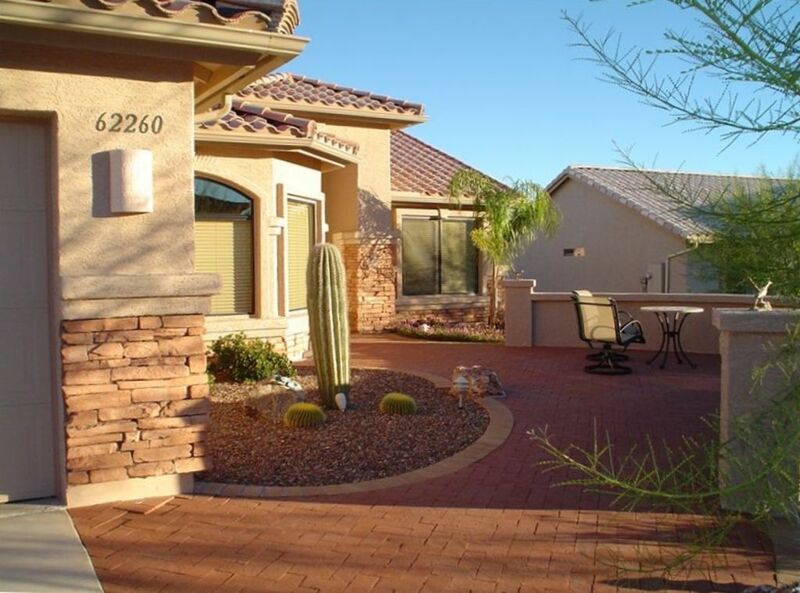 Nestled in the foothills of the Catalina Mountains is our beautiful fully furnished home. It was built in 2006 and has only been used several months during that time...everything is like new. We put high quality furnishings in our house, as if we were the only ones who would use it. We built a front patio with a privacy pony wall. We just replaced the carpet through-out the house May 12, 2016 and put new stainless appliances in the kitchen. This is located on a curve in the street, so you have a great place to read the paper and sip your morning brew. We also put in a huge backyard patio for your evening entertaining with seating for many (patio furniture and a flagstone knee wall). We have wonderful views of the Catalina's from both patio's. We just added a Murphy Bed in the den, so extra bed space is available. We also upgraded our TV package, so we have on Demand and the second highest level of DISH network. Although this is a 55 and over retirement community, if at least one of you is 40, you are allowed to rent this property. The house is beautifully decorated in Southwestern Designs. My husband taught Physical Education for 32 years. He coached Men's Volleyball and won 7 Wisconsin State Titles. He is now retired. I taught 6th, 7th and 8th grade science for 33 years, retiring in the spring of 2016. I have coached Volleyball (1 State Championship) and Golf (1 State Championship) for 33 years. I am loving retirement!! We love to golf and Saddlebrooke was the perfect match for our retirement plans. We wanted an active adult community with a lot of fitness choices. We love to sit out on the front patio in the morning and read the newspaper. In the evenings we enjoy the back patio with the setting sun on the mountains. Tennis racquets/balls on property. Golf cart available for $ 100 a month rent. Thanks for staying...I did ask why they gave us a 4 star instead of 5, as this is very important to us. They said that they were a bit disappointed in the pillows. We have since replaced all of the pillows as well as the bedding. We always strive to do our best! Great property, very comfortable and good location. We enjoyed our week stay at this property. It was really comfortable with a fantastic back yard and pet friendly. Lots of great amenities at Saddlebrooke. There were only two of us but it is spacious enough that you could easily accommodate a larger group. Thanks for the nice review. Enjoyed having you! Come again anytime! This was my first experience with VRBO and it was amazing. From the start, I knew I made the right choice. The owner, Sue, was very quick responding to my questions about the property and the booking process. Once I had my reservation, she continued to keep keep me advised about the process. When we arrived at the home in Saddlebrooke, we were amazed at how well appointed the house was and everything in the online ad was completely accurate. We stayed for about a week and felt right at home during our stay. Sue is a terrific owner and a great example of the type of person you want to do business with. We will definitely be looking to VRBO for our future needs.Thanks! Sue was a fantastic host, an absolute pleasure to work with! The house was wonderful, it had a wonderful layout, comfortable beds and everything we needed! We loved sitting in the front and backyards to watch the sunrise and sunsets. Would absolutely stay there again! We stayed here in early December and enjoyed staying here very much. Well proportioned rooms, very nice lay out, great living space and back yard. We will definitely return.